Some football shirts have made this list by virtue of having a simple, but classic design, some by becoming memorable through exposure in a major tournament, while others have arrived here by being memorable purely by their distinct looks or features. This entry in our Top 50 falls firmly in the last of those categories. 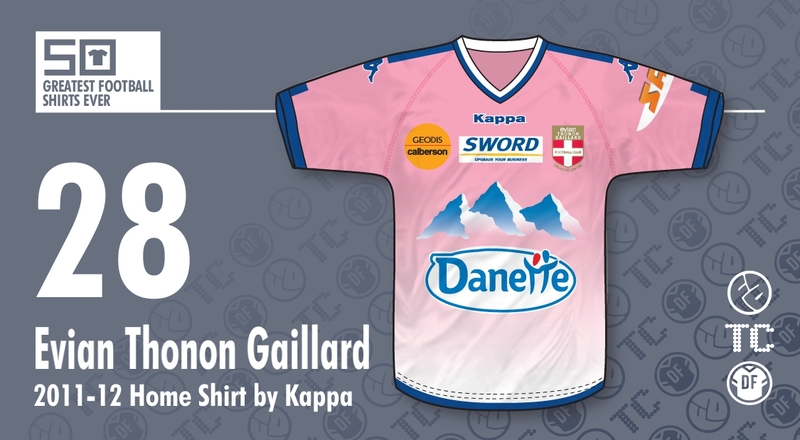 As of next season, Evian TG - Évian Thonon Gaillard to give them their full name - will play in the French Ligue 2, having been relegated from the top flight at the end of 2014-15, but their story is a rather interesting one, having only formed 12 years ago. As such, they must surely rank as the newest club on this list. They were originally called Football Croix-de-Savoie 74 as a result of a merger between FC Gaillard (who had actually been around since 1923) and FC Ville-la-Grand. In 2007, they merged with another team, Olympique Thonon-Chablais and subsequently, they became known as Olympique Croix-de-Savoie 74. So where does the Evian part come into all this? Well let's get the obvious out of the way... Yes, the Evian in the name IS the same as the brand of overpriced, bottled H2O. The owners of the club are the Danone Group, owner of the Evian brand and in 2009, the president of the Groupe Danone, Franck Riboud, was made honorary president. He then changed the name of the club to its current incarnation. Firstly, it's pink. Not enough football shirts are pink. Palermo fly the flag and look great doing so. Evian TG's shirts are something else and what makes them stand out is that Evian connection. Aside from the colour taken from the Evian corporate palette. right there on the front of the shirt, proud as anything, is the familiar Evian 'three mountains' logo. What I love about it is it doesn't just look like a mountain range... it also reminds me of several shark teeth, jutting jaggedly towards the players' necks. So what else? 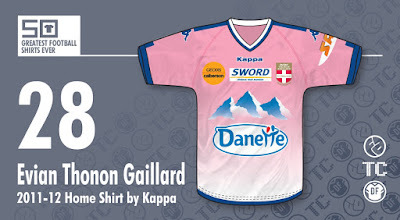 Most of Evian TG's shirts are pink and feature the mountains, so why this one? For me, what sets this apart is the fade effect on the pink, gradually turning to white at the bottom. Secondly, the blue trim. Pink can be hard to pair with another colour. The aforementioned Palermo successfully marry pink with black, adding an ominous air to what could be regarded as a predominantly feminine colour. ETG on the other hand, have opted for a vibrant blue, which seems to emphasise the boldness of the pink, rather than contrast with it.